You are here: Home » MEDIA » Movie books » Shoot Like Spielberg by Christopher Kenworthy (book review). Shoot Like Spielberg by Christopher Kenworthy (book review). I was commenting to one of my reviewing team recently on the slow pace of a particular famous space opera film from the mid-1970s and pointed out that it didn’t necessarily apply to all directors from that time. 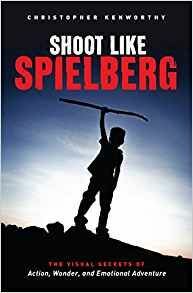 With Christopher Kenworthy’s book, ‘Shoot Like Spielberg’, it quickly became apparent why his films have endured. Of the 8 films used as examples here, Kenworthy says Steven Spielberg uses similar shot techniques throughout and it is invariably done by fast action without cuts keeping the cast in frame. In some respects, I wish Kenworthy had gone beyond the examples shown here and pointed out the other films Spielberg used these techniques so they can be looked at for comparison. There is a mention made at the conclusion of the book of which other Spielberg films have similar choices but it would have helped on those films I haven’t seen. If the 8 examples, I’ve still to see 3 of them for one reason or another. Oddly, the only things Kenworthy doesn’t make an example of is how Spielberg applies the expected shock or twangs the emotional strings which are his distinctive trademarks. I mean, we know we’re going to see the decapitated head in ‘Jaws’ and, even knowing that, we still jump because of the earlier scene making us think that’s where it’s going to happen. I suspect Kenworthy doesn’t want to reveal everything and he says that the ‘Master Shots’ books cover some of the other points. He also points out that these books should be used as learning aids rather than copying how famous directors apply their techniques. Oddly, this was also one of the fastest reads I did in this series but maybe it’s because I’ve absorbed Spielberg’s techniques without realising it was so embedded. As a masterclass and you haven’t noticed from repeat viewings, then you’ll learn a lot from this book. You might suddenly realise you’ve been learning from Spielberg all along which has to be one of the best things of all. No wonder he’s reluctant to give interviews. His work speaks for him. « Don Lawrence: Illustrators And Comic Strip Art: An Illustrators Special #3 (book review).